Take a look at this wedding cake. It’s designed to look like a pac man level and features Pac Man and Ms Pac Man sitting on the top of a level full of power pellets and ghosts. The groom is one of my best friends on the planet and I’ve known him since high school. The Bride and I decided on a Pacman theme and this is what I came up with. I thought Pacman was rather fitting for many reasons. 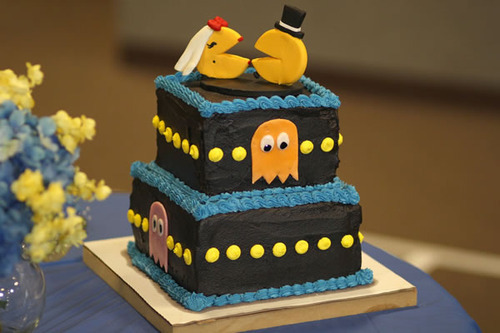 First, he’s a Pacman master, second, the wedding colors were blue and yellow, and third, I had made a much crappier Pacman cake for him years ago for his 22nd birthday. This was a nice second try. He absolutely flipped over it which just made my day. I wish I had a video of his reaction but alas, no such luck.